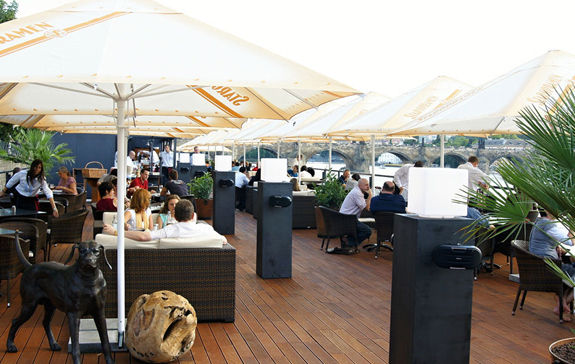 Prague’s gorgeous riverside location can be enjoyed all year round for tourists as well as locals with the recent opening of Pizzeria Grosseto’s Marina floating restaurant. 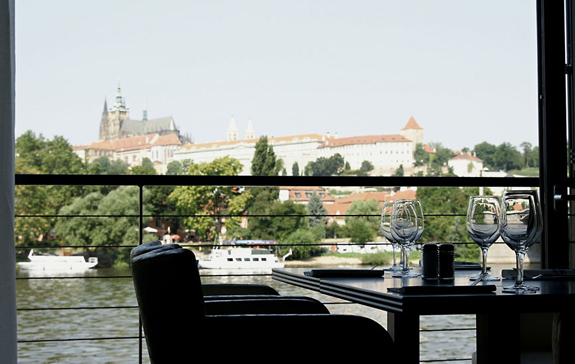 Grosseto’s offer up an unbeatable location (stunning in summer weather) for the same price as their 4 other restaurants around Prague. Opened towards the end of July, this place has proven to be very popular with both locals and tourists alike. If the weather is good, the 440 seat restaurant is packed. I found out myself to much disappointment one weekend, we tried to get in 3 times, the first time was at 11.30am when the restaurant had just opened for the day - they were already fully booked. You can wait around on the deck outside, but with two small, hungry kids forget it! A few days later on a rainy weekday we had no trouble at all. During our meal we learnt from our waiter that some people often book 3 days in advance when they’ve heard that a sunny weekend is predicted! The restaurant decor both above and below deck is stunning. Being a rainy day we were indoors but surrounded by ceiling to floor windows meant that we were not robbed of our view. Even on sunny days the windows slide back and the space opens up to the water and the buzz outside. Below deck was reached by an elevator - thankfully, as we had Ari in his stroller. Staff were very pleasant and attentive. Ari received a complimentary box of pencils and a colouring in sheet as well as a high chair (I only noticed 2 or 3 chairs though, when walking through). Handy was the bread and herbed butter that was immediately placed on the table - this kept the little one busy for quite a while! We were told that a baby change table is currently on order and will be installed in the women’s toilets soon. 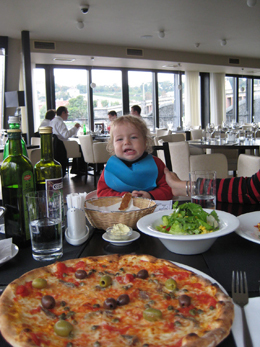 Food was fine, especially the pizza. The menu is the usual pizza, pasta, salad fare but they do offer various cuts of meat and fish which looked pretty good and the kitchen is opened up so you can observe the chef’s at work. There is currently no kids menu but you can order pasta as a half size for the half price or get the kids to share a pizza. 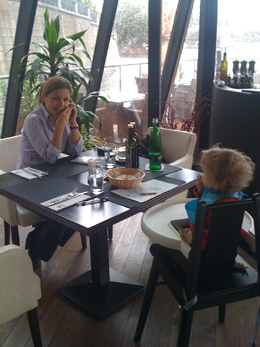 Most encouraging was the news that Marina will be building a detsky koutek (kids corner) on-board. Planning permission is underway to enclose the upper deck with a retractable glass roof and sides. Once underway the koutek will be placed here along with gas burners, allowing another level of restaurant space - year round. We will keep an eye on their progress and revisit again once the koutek is up and running. Growing up in Sydney causes me to be completely in love with water and boats, so eating waterside is a lovely treat. Watching the busy rivercraft passing by is entertaining not just for me but for Ari who is fascinated with anything mechanical whatsoever. I love how Prague is developing the riverbanks, putting in public transport ferries and encouraging water craft on the river - this gives the city such a boost internationally - our Viennese rivals can only look on in envy and weep! DIRECTIONS: BY METRO: Take the green line A to Staroměstská and walk 150 metres towards the river. BY TRAM: Take tram numbers 17 or 18 to Staroměstská. BY CAR: Paid parking is available underneath the Rudolfinum for 50CZK per hour, take the lift up and you will be right at the boat.